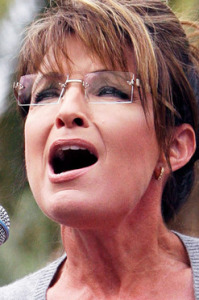 Intellectual Poison: Is The Foreign Press Correct in Branding Sarah Palin a Traitor? Is The Foreign Press Correct in Branding Sarah Palin a Traitor? I read Foreign Press Says What America's Won't: Sarah Palin is a Traitor and am in complete agreement with everything Sarah Jones, the author, writes. Even with such a well-reasoned and well-supported argument I knew there would be an attack by Sarah Palin's defenders. But these people are, by and large (and buying large but that's another post), ignorant, angry and intellectually dishonest. Whenever a point they have tried to make is shot down by the guns of reality, facts and common sense, they change tactics and try another avenue to discredit the article. The comments, from Sarah and Jason, who runs the site, are strong and reasoned as are the many comments from other readers in the face of often moronic comments by the We Heart Sarah goon squad. I try not to wade into political discussions because, in reality, they are akin to shouting at a brick wall. I have no illusions that all of the reasoned responses to the Palin trolls had any impact on their worship of her false idol. But I did comment and wanted to repost it here. I've read the full article (and LOVED IT!) and then read each and every one of the comments thus far. Arguing with the SP Defenders is like trying to catch a greased pig. Just when you get a grip on them with some inescapable rational logic, they squeal, squirm and run away oinking some other totally bogus BS lies wrapped in idiocy. Shellena is just one of many ignorant fools who have drunk from the cup of stupidity presented by a wholly divisive, uninformed spewer of wrongs, distortions and outright lies delivered with a wink. Sarah Palin is a pox on our democracy, just as many of the sitting GOP representatives are boils on the backside of our democracy. They exist for their own and their special interest masters, they do not give a whit about typical Americans. They do not give a damn about undoing the incredible harm 8 years of Bush did to our country. They only care about obstructing any success from that "black guy" in the White House. I would personally like to shake the hand of any sitting Republican elected official who has publicly come out against the divisive rhetoric of people like Palin, Gingrich, Limbaugh, Rove, Cheney, McConnell, Cantor, Boehneer (that's MISTER Oompa Loompa to you, buddy!) and all the rest of them. They are behaving like petulant children at a playground, pissed off and whining because someone else is using the swings. To my brethren fighting the good fight against these ignorant fools parroting GOP talking points despite their easily demonstrated factual "challenges" I say Thank You. Thank you for standing up for our country and for what is right. Reason can and must eventually drown out the idiotic and hateful rhetoric of the Right (always hate that term for them, they are clearly the Wrong). And, by all means, if you dissent, feel free to comment and support your comments with facts and links. Show me anything positive about Sarah Palin, show me anything genuuine, show me anything that demonstrates she's anything but a lightning rod for ignorant and angry Americans.